Welcome to Craft Ideas Daily! I have loved Hello Kitty since she first appeared in the United States and am always on the lookout for any Hello Kitty or Sanrio products (that I don’t already have). 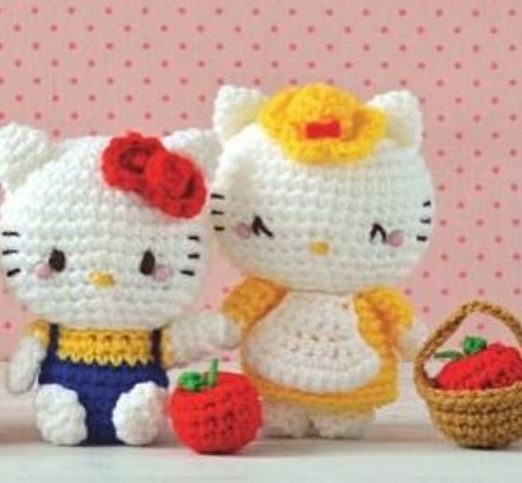 Since I know a little bit about crochet, I was definitely interested in Hello Kitty Crochet . I found the patterns to be very clear and simple to understand and I am used to only making really basic crochet projects. They even include photos and that was very helpful. They projects are ranked with Hello Kitty’s bow, one is easy and two is a bit harder. I like how the book lays flat, so I don’t need to hold it with my knee while working. I finished making Hello Kitty in a ballerina outfit, complete with a pink tutu. Now that I’ve made Hello Kitty, I’d really like to make the whole family, with Mama, Papa and her sister Mimi. Hello Kitty is one of my favorites, but they have many of the Sanrio characters in Hello Kitty Crochet , too. I love Little Twin Stars and My Melody, so I hope to try those soon, too.